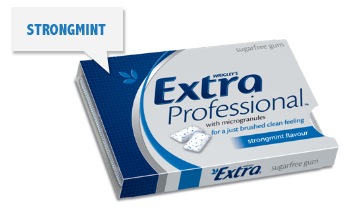 Do you enjoy the refreshing taste of chewing gum? Well gum chewers, clinical studies have shown that chewing sugarless gum for 20 minutes following meals can help prevent tooth decay. Chewing sugarless gum increases the flow of saliva, which washes away residual food, neutralizes the acidity of certain foods and beverages and coats the mouth with disease-fighting substances. Saliva also carries calcium and phosphate, which help strengthen tooth enamel. Chewing gum can also help with dry mouth and bad breath because of the increased saliva. You might be surprised to learn that the Australian Dental Association actively promotes sugar-free gum chewing because it is safe and improves oral health. Look for chewing gum with the ADA seal because you can be sure it’s sugarless. Chewing gum is not a substitute for good oral hygiene practices it is still recommended to brush your teeth twice a day with fluoride toothpaste and clean in between your teeth with interdental brushes or floss at least once a day and visit your dentist regularly. We do not recommend children chew gum and sugar-free gum is not recommended if you have braces. If you have any questions regarding sugarless gum, please feel free to discuss it with Dr Cassimatis during your next visit.